A burger and a beer for $10 at BPV. And Cards baseball on the big screen! For the following Cardinals spring training game telecasts from Florida (each starting at noon, CDT), participating BPV restaurants will offer any menu burger and a pint of domestic beer for $10. Here are those dates: March 12, 13, 14, 15, 16, 17, 19, 21, 25, 26, 27, 29, 30 and 31. And April 2. 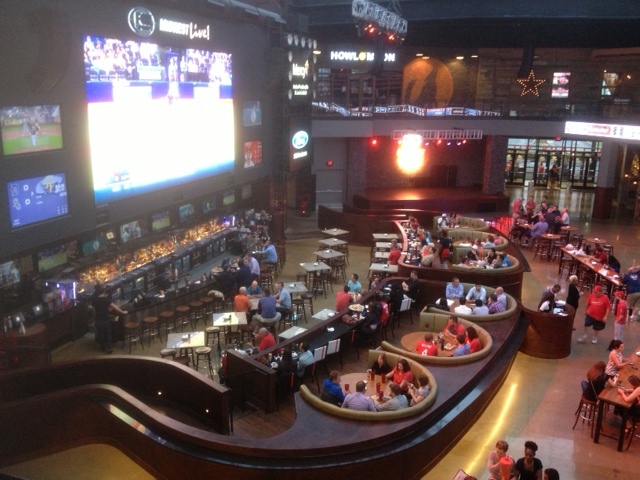 The games will be shown on BPV’s giant 40 foot screen as well as on monitors inside each restaurant. Budweiser Brew House, Cardinals Nation and Fox Sports Midwest Live will serve up the burgers. Drunken Fish will offer an appropriate burger substitute. This entry was posted in St. Louis Food and Drink News, St. Louis restaurant news and tagged Ballpark Village, Budweiser Brewhouse, Cardinals Nation, Drunken Fish, Fox Sports Midwest. Bookmark the permalink.